we have always been big fans of Minnie Mouse. she’s cute, sassy, and has an incredible sense of style. she practically invented the hair bow trend, for starters. no one else rocks polka dots quite so well. and every couple of years, she shows us that she is up on the latest chic trends, while still staying true to her classically girlish flair. a true style icon in our eyes! we were absolutely tickled when we saw LeSportSac’s fun Celebrate Minnie collection: bags and accessories with an absolutely fabulous homage to Minnie Mouse herself! the print showcases some of Minnie’s best looks from over the years, all in a chic white-on-black polka dot print that you can’t help but love. we are particularly obsessed with the Basic Backpack, the Cosmetic Bag, and the perfect EveryGirl Tote. and of course, our very own Minnie Mouse look… her oversized bow inspired this sassy accessory from our spring collection! don’t you just love it?? 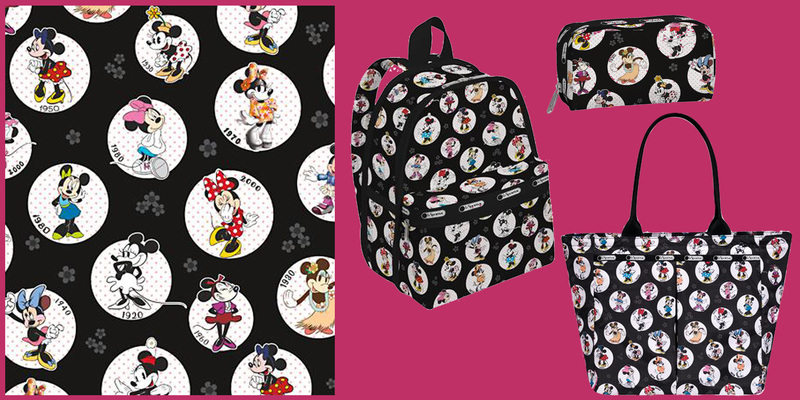 Categories: simply fabulous | Tags: disney, lesportsac, mickey mouse, minnie mouse, polka dots, style icon | Permalink. This is so cute! I love Minnie Mouse!